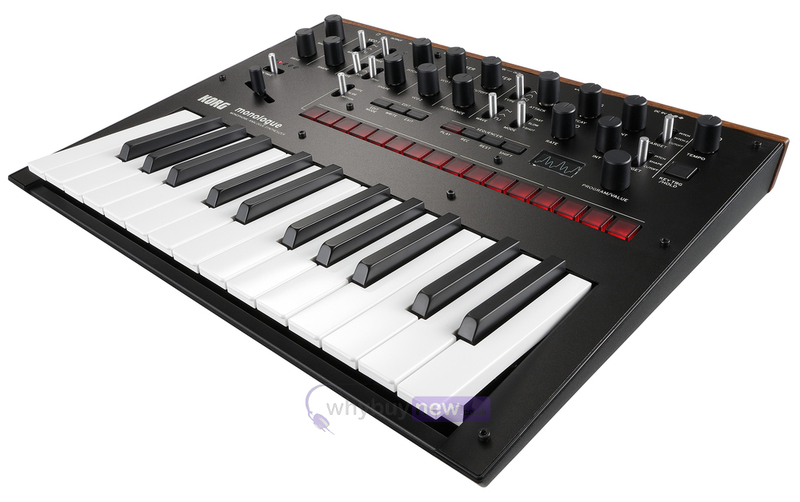 The Korg Monologue (Black) is a 25-key monophonic synthesizer, which features an analogue synthesizer circuit based on the design of the best-selling Minilogue. The Monologue is compact and lightweight, and can be powered by batteries, making it fantastically portable. The Monologue is a truly unique new synth for all types of musicians; featuring new voicing and sound sculpting abilities - at an amazing price. The monologue's completely new filter, modulation, drive, and LFO can generate powerful basses and sharp leads, creating awesome mono sounds that showcase its single-voice design. The step sequencer has also been dramatically expanded, allowing more intuitive and more complex editing. With a line-up that gives you a choice of five eye-catching colours, this compact instrument has a strong personality to match your own. 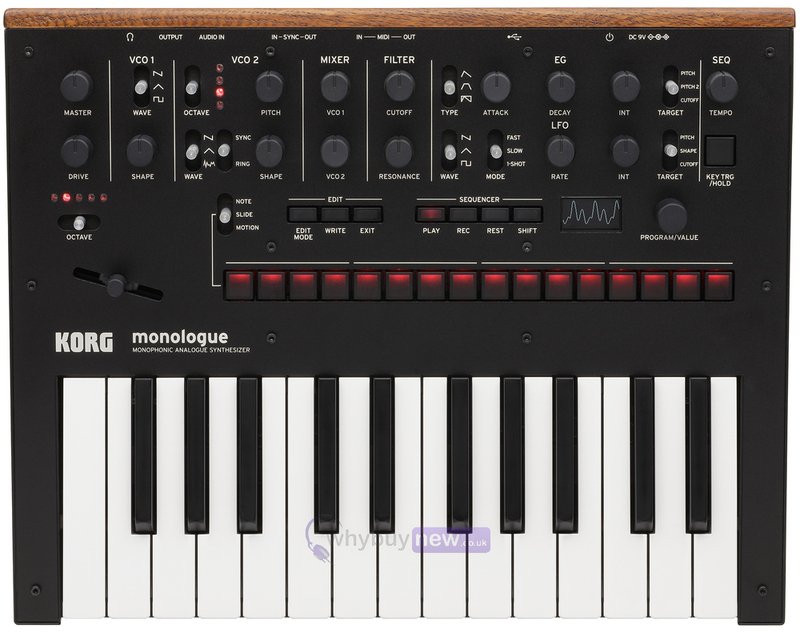 The monologue contains monophonic analogue synthesizer circuitry that builds on the circuitry of the Minilogue. But that doesn't mean that the monologue is simply a one-voice model of the Minilogue. It's a monophonic beast with stunning power that comes from a redesigned envelope section, modulation routing, and a filter with powerful low-end punch. The keyboard section features the acclaimed slim keybed of the Minilogue and the MS-20 mini. To make monologue a synth that any musician can immediately pick up and play, the keyboard covers the E-E range of notes - just like a guitar or bass. The monologue goes beyond analogue synths in its price range by adding 100 preset locations. Select a program for instant access to great sounds - - ranging from thick basses to deep subs to brilliant cutting leads and even percussive sequences. No need to have deep synthesis knowledge; just choose a sound and tweak - a workflow that is very familiar with musicians today. Built-in programs provide 80 preset sounds and sequences made by creative artists around the world including legendary electronic artist Aphex Twin, plus 20 user locations for saving custom sounds. The OLED display will show the waveform in real time as you sculpt your sound. Visual feedback is both educational and entertaining, and represents a first on a hardware synthesizer. The monologue offers motion view that visualizes the value levels for the motion-sequenced parameters. "See" your motion sequence as it happens. 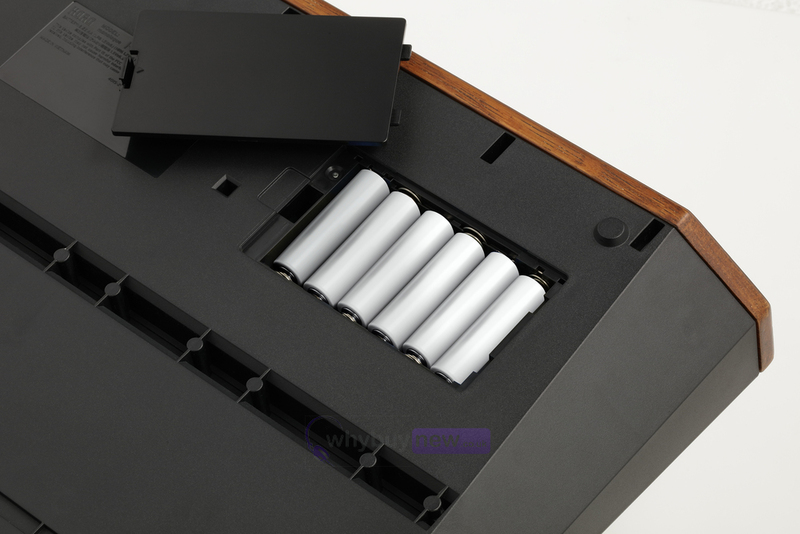 In addition, unlike most analogue synthesizers in its class, the monologue can operate on batteries. Even if you're a hardware performer who uses numerous units, you won't need to worry about providing additional power supplies and installation space. 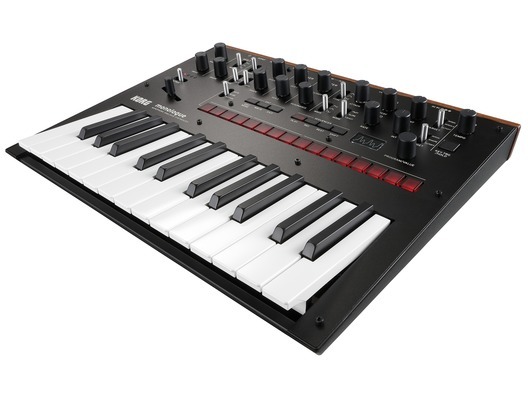 In addition to 5-pin In/Out and USB MIDI, monologue includes Audio Sync connectivity, which allows it to play in time and integrate seamlessly with KORG Volcas, Electribes, Minilogue and SQ-1. Use the monologue with your DAW as both a USB MIDI controller or a versatile analogue voice. Send clock over USB and use Audio Sync to chain monologue's clock to other Audio Sync-equipped products. Dimensions: (W x D x H) 350 x 276 x 76 mm / 13.78" x 10.87" x 2.99"